President Xi Jinping and US President Barack Obama's key national security aide hinted at tensions ahead of a state visit to Washington by Xi. 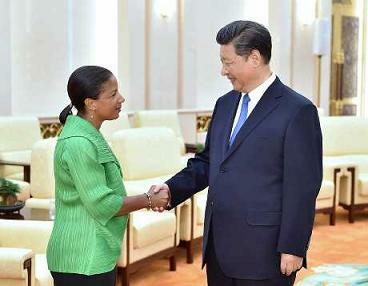 Meeting in Beijing with US national security adviser Susan Rice, President Xi said that he looks forward to continuing a dialogue with President Obama next month and working to ensure that China-US relations keep expanding. the people of both countries." Rice responded that Xi's visit to the US will provide a “great opportunity" for the two countries “to strengthen and deepen our relationship" as they seek ways to benefit their peoples as well as the world. “At the same time, we obviously have issues of difference and some difficulty that we need to work through and we will continue to do so," she said. Xi's visit to the US comes as the countries have shown a willingness to cooperate on global matters ranging securing a nuclear deal with Iran to climate change. But they have also clashed over issues including what Washington and some regional countries see as China's increasing assertiveness in Asia as well as its territorial disputes with countries close to the US such as the Philippines and Japan. The tone of Rice's talks with other Chinese officials earlier today was similar to her encounter with Xi, highlighting areas of cooperation while recognizing differences. The US and China, both permanent members of the United Nations Security Council, participated in negotiations that secured a landmark nuclear deal with Iran last month. Beijing and Washington have also worked together as members of the six-party talks on North Korea's nuclear programme, which also take in Tokyo, Seoul, Moscow and Pyongyang. That forum has been essentially dormant for years though China, which serves as host, supports its revival. Rice also met with Fan Changlong, a vice chairman of the Communist Party's powerful Central Military Commission, which is chaired by Xi.